Cycling Mode Share: Unconfirmed, in 0.5% range (study) to 2% (local cycling advocate). Cycling in Prague seems to be limited to the more daring. More cyclists wear helmets than in Karlsruhe (Germany), Strasbourg (France), Freiburg (Germany), or other centres where the cycling mode share is much higher. More spandex is seen here than in these cities. Fewer women are seen cycling here, maybe only in the range of 20 percent. There are the commuters, the randonneurs out for their exercise, the couriers dashing about the streets as if every trip was an Alley Cat challenge, and some recreational cyclists making their way along the river greenway. 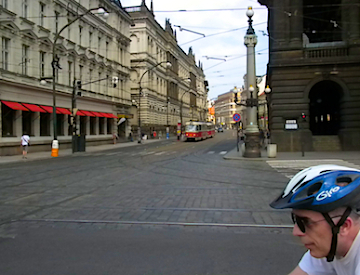 Cycling in Prague is much better with mountain bikes, wide tires, and shock absorbers. Cycling on folding bikes with 38 mm tires was enough of a challenge, bouncing from one cobblestone to the next. While a city in administrative structure, not a metro area, Prague does have 15 local districts with their own budgets and control. 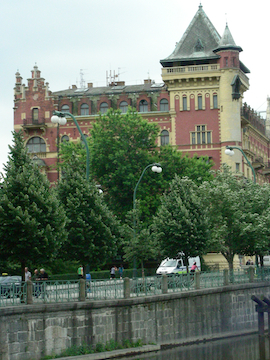 From a cycling perspective, Prague 1 is the most challenging district, with its many heritage buildings and streets. Here, many streets are paved with old style cobblestones. Asphalt is scarcely used. The local council resists changing from its heritage past thus being a mega attraction for tourists. Apparently, it is the fourth most desired tourist destination in Europe. No wonder. Its fantastic and extensive inventory of medieval, renaissance and art deco style buildings demonstrate the best in architectural designs, both on the building fascia and in its interiors. It took us three attempts over the last few years to come and visit this city. It was worth the effort. Anywhere you go, magnificently designed buildings are in your view. Entry into the public buildings provides fantastically designed interiors with the figurines, wall murals, columns, staircases, and materials used to finish the floors, walls, and ceilings. 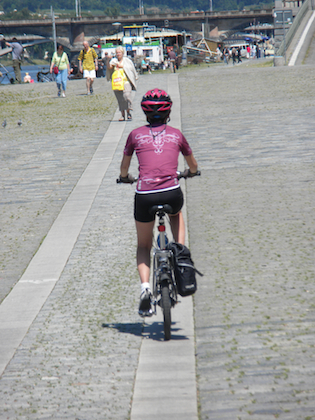 In Prague 1, cycling is challenged by the centuries-old cobblestones, which provide very rough surfaces, gaps not filled in by sand or mortar, ground heave, and polished finishes not desirable when rain is falling. The local council is resisting replacement of these cobble stones with the ones which would provide a smooth, cycleable track. The streets are also very narrow, with the exception of a few arterial roads. Providing separate cycling tracks necessitates car-parking removal. 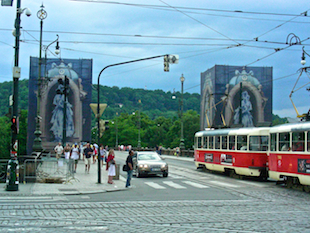 Prague has an extensive tram system, with very frequent service and high ridership by the residents. There are 30 tram routes in this city, which provides its own challenge for cyclists. With tram tracks, there is little room for adjoining car lanes, which needs to be shared with cyclists. Most car lanes are too narrow for comfortable cycling. Frequently, tram tacks have separation from car lanes for a block or two every now and then along streets and then only to disappear again. 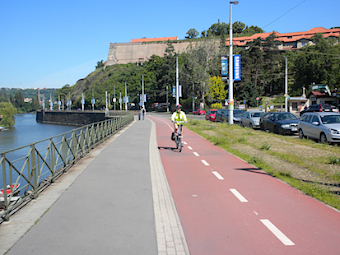 Prague's greenway route with better designed bike paths improve as one moves further away from historic area. June 2010. Photo by HJEH Becker.More cyclists were using the greenway path in these areas-- and this is on a weekday early afternoon. Prague does not seem to mind closing down a block or two of streets to car traffic, except those vehicles needed to service the local buildings. On these blocks, tramlines along with room for pedestrian traffic brings forth crowds of people walking, eating at streetside cafés, and shopping. Traffic jams happen at lunchtime and in the evenings. Cycling is slowly undertaken by weaving through crowds on very rough cobblestone surfaces, as if it were a ballet on wheels. The hypothesis that I work on is somewhat based on the Third Wave Cycling thinking and supported by the City of London Cycling Master Plan from year 2000. From the research work that went into the plan, the plan puts forth the assumption that cycling mode share is bought by investment in cycling infrastructure. Prague is an example where the investment has not been made and the cycling mode share resembles that of Metro Vancouver, excluding the City of Vancouver. A local member of the city’s cycling council stated that in the past, there was money for cycling infrastructure but the plans were not in place. Now, plans are ready to be implemented but there is a lack of money for the investments. 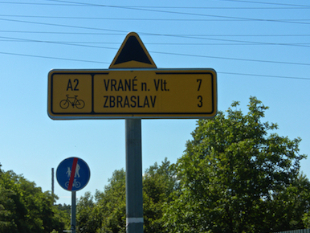 Prague cycling route signage was more evident in areas further away from the historic area. June 2010. Photo by HJEH Becker. system on roads showing destinations, type of cycling route from separated facilities to shared, and distance in some cases. There is some cycling infrastructure as one travels about. It varies from signed routes for cycling, closely spaced sharrows on streets, to bike lanes some with coloured crossings, and to red coloured bike lanes. The bike lanes are usually not wide enough for comfortable cycling or to attract more than the most confident. to the right and away from the bike lanes, then one may encounter a lip or just those uncycleable cobblestones. One must be always ready for a jolt or one must just learn to cycle in a straight line on a 25 cm wide tile path. Further south, the path turns to asphalt with mixed use and a centre line to separate directions of travel. Then for a while there are separated cycling and walking paths. Intersecting driveways are marked in red with cycling and walking symbols in the direction of oncoming car traffic. The cycling path is even in red colour. Then it turns into a road where local cars are permitted. Then the mixed-use path returns running along side with railway tracks located within a switching area. And so on the cycling facilities vary. On a short, tight path beside a rail overpass bridge. Prague June 2010. Photo by HJEH Becker. 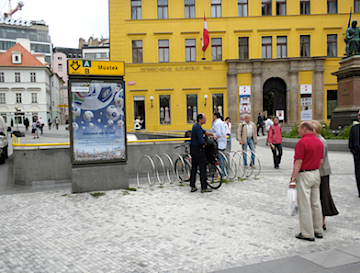 Prague recognizes that it has a large deficit in bike parking, especially within the Centrum area. With 1,000 U-type bike parking spots in place which include some poor-quality manufactured circular racks, more is needed. Apparently, the U-type parking spots are very inexpensive, produced by a local pipe bender. The city buys the racks and the local district pays for the installations. While sitting in a very comfortable Deutsch Bahn express bus from Prague to Nuremburg, some cycling infrastructure was seen in the suburban parts of the city. It did not seem well connected from a network perspective. Bike signs were visible along the way. Cycling in Prague is still for the confident. 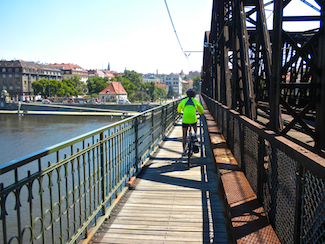 After experiencing cycling in Southern Germany and being pampered with their facilities, the cycling infrastructure in Prague is not yet quite for us. Now off to Copenhagen.